Far be it from me to talk you out of shucking oysters to eat them on the half-shell. After all, raw oysters are one of my favorite things to eat in the whole wide world. Shucking oysters, however, is definitely not one of my favorite things to do. While setting oysters on the grill to get them to let loose of their firm grip on their shells always carries with it the danger of one or more of them exploding, I find the strategic use of the grill lid and some head's-up caution makes the ease of eating them, as well as the lightly smoked flavor they tend to pick up, well worth the risk. Note that this method works with any type of oyster but super small Olympias, Kumamotos, or other Pacific oysters can get lost through the cooking grate: I recommend setting down a piece of foil with a few holes punched in it if you want to grill particularly small oysters. You can grill however many oysters fit on your grill. Plan on 4 to 6 oysters per person as an appetizer. Set the oysters, with the cupped side down, on the cooking grate. Cover the grill and cook until the oysters have opened their shells and are opaque and cooked through but not yet dried out, about 5 minutes for smaller oysters and a few more minutes for larger ones. Note that most oysters will open their shells only in so much as it will be easy to lift off the top shell; they don't actively open up the way cooked mussels and clams do. Use tongs or heavy duty oven/grilling mitts to remove the oysters from the grill. Remove the top shell and, for easy eating, run a sharp knife along the inside of the bottom shell to cut the oyster from it. Serve the oysters hot or warm. You can top the oysters with a bit of butter, compound butter, your favorite barbecue sauce, or, for something tasty and a bit different, a wee dollop of pesto. Be sure to serve them while they're still hot for the best experience. 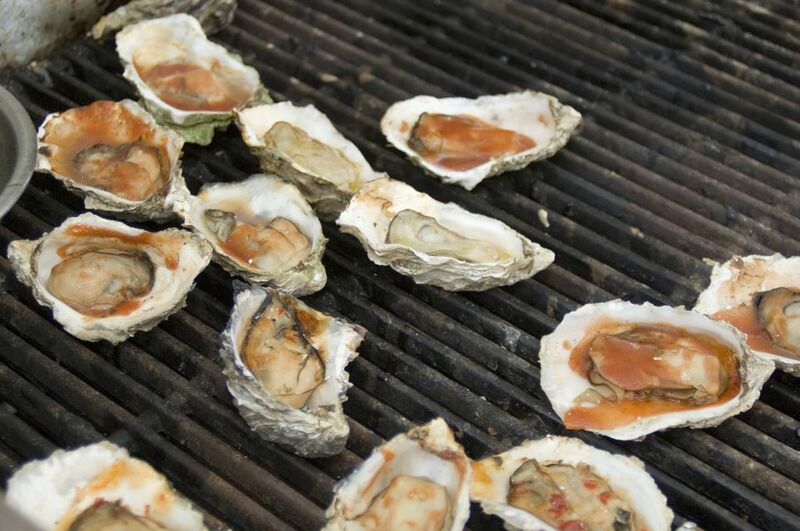 Note: If you want to cook the oysters with some sauce as pictured, you'll need to remove them, take off the top shells, put them back on the grill, and then sauce them—more of a hassle, but for the result of barbecue oysters, I'd say it's worth it!